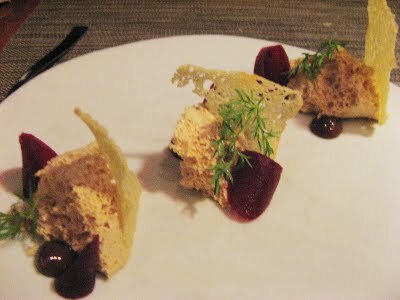 I’ve been wanting to take my palate on a molecular gastronomy (the marriage between science and cooking) field trip at WD-50 for a while, but as many of you foodies know, finding friends to share the adventures can sometimes be a challenge. Thankfully I have a group of open minded, food loving “amis”, just a shout out to ya’ll. Fast forward to the end of an amazing meal, as if that wasn’t highlight already, we got to tour the squeaky clean kitchen. Wylie Dufresnewas super friendly and down to earth, I actually slipped him one of my Chubby business cards, he said he’s looking forward to reading my review, very kind of him, maybe he’ll read this someday? 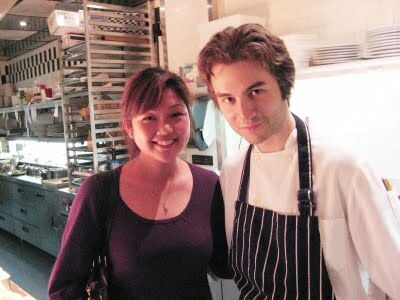 Then we met Pastry Chef Alex Stupak, I’ll admit I have a dessert crush on him, he had me at “Yuzu Tart”(from Bon Appetite Cafe). Told him about that, and how I went back just for more *wink*, I guess that was my way of “flirting”, cheesy I know, I’m working on it… that’s a whole other blog i would have to start. To start I had a glass of the Pink Coteaux d’aix very fruity and light. My friend had a mix sake drink which was very smooth and had a nice sweet after taste. 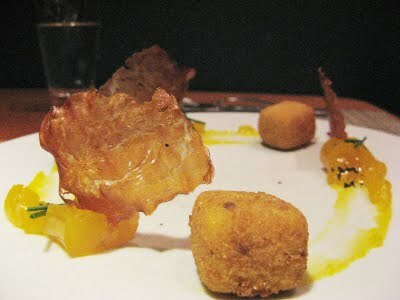 We didn’t do the tasting menu, since it was 3 of us, we did our own tasting of 9 dishes. The Hypothesis: A meal that will take my senses on a joy ride. 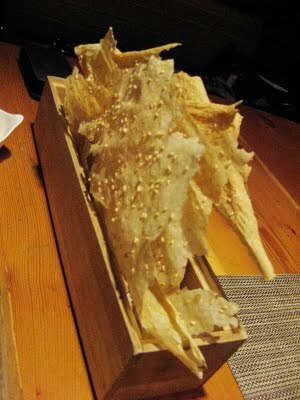 The Bread is paper thin and super crispy, with sprinkles of sesame, playful and addictive. 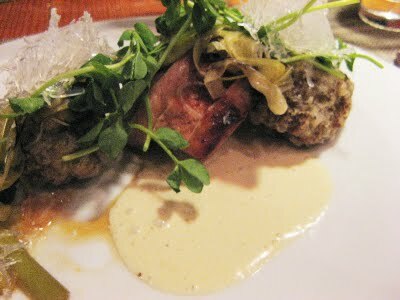 Eggs Benedict, one of their signature dishes, was one of my favorites of the evening. 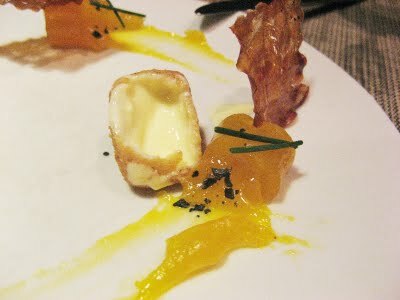 Loved the hollandaise sauce tucked inside an Thomas’ English Muffin crumb made outer shell, fried with a burst of creamy pleasure to compliment the tube shaped yolk and crispy ham. The sprinkle of chives had added a nice oniony aroma. Unlike the eggs benedict, where the flavors were somewhat familiar, but magnified, the Hanger Tartare was a complete stranger to my tongue. Flavored nicely with smoked almond and paired with frozen banana ice-creamish pieces and a layer of cream, plus coin sized hibiscus reduction dabs. I would of never though of raw beef and banana, but it worked, the banana flavors hid any signs of raw beef taste, it had a nice hint of sweet creaminess and fried sweet potato strings added a level of crunch. Aerated foie, what’s not to like here, very light and fluffy, think perfectly made marshmallows with holes, contrasted by these beautiful pieces of pickled beat, cut in cylinder, with an airy brioche chip. 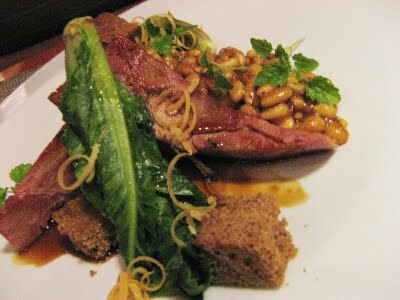 I can’t say much about the Lamb Shoulder since I haven’t learned to appreciate the flavors of lamb, but I would love to have a whole bowl of the pine nut “baked beans”, when I think of pine nuts, it’s usually a topping, and the essential crunch is always a selling point, but WD changed my perception by cooking them ’til semi tender in a sweet and very smokey sauce, without loosing the pine nuts’ natural flavor. It’s like regular tail gating baked beans, only 10 times better. 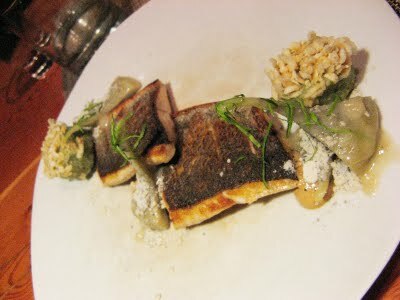 The crispy skin was perfect on the Mediterranean Bass, it came with artichokes, a bamboo rice, which can be best described as a mochi centered crispy rice ball, i think it was made from a semolina halva, which gave it that gelatinous texture, it reminded me of this rice snack I had in Korea, a hint of sweetness, loved the sticky texture and surrounding crunch of rice puffs. On the list of ingredients it mentions chicory, which I’m not familiar with. Pork Loin was tender and pink, the charred leeks had a bit of acidity and saltiness, tasted pickled, there were these coconut jelly shavings on top (the clear strands) which I was expecting big flavors, but it didn’t and texture was a bit crunchy, that aside, the dish was excellent, it’s sitting on a creamy coconut mustard sauce and accompanied by deep fried caraway (similar to cumin) mashed potato balls, a nice crunchy exterior and a center that was smooth and aromatic. 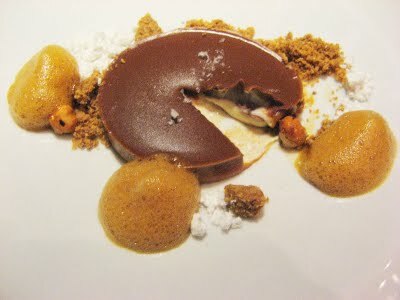 Chocolaty foam, frozen coconut pieces, whole roasted hazelnuts and chicory surround a creamy semi sweet Hazelnut tart, very familiar flavors, but again, with a more playful twist of textures and presentation. Very yummy. 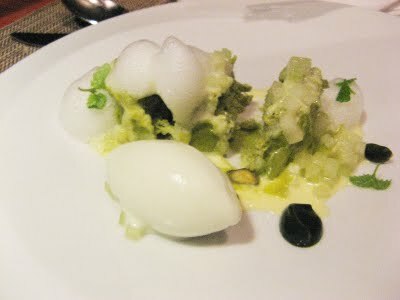 The Sicilian pistachio cake was the most unique of our desserts, I can’t seem to find anything to compare it with. 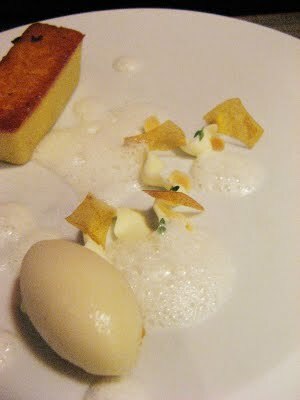 There’s a honeydew ice cream which was hiding behind a strong lemongrass presence, a little bit of lemon foam, cake and this thing called chartreuse? that yellow-greenish color? or maybe it was from the french liqueur called green chartreus, I’m not too sure, but one thing for certain, this was very interesting and my senses were confused in the best way possible. Funny thing about the Caramalized Brioche plate, I liked everything but the brioche, which was filled with a fruity center, it was ok, but I wasn’t asking for more. The Buttercream swirl on the side was very creamy and a bit firmer than you would imagine, with thin apricot pieces on top, playing around lemony foam and light sprinkles of thyme, very enjoyable. 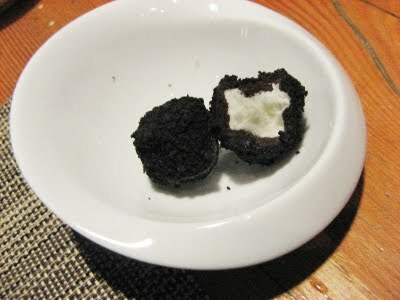 With our check came these frozen oreo-like bites to end a yummy meal.The Conclusion: All of my senses were screaming for more, it will be hard to go back to a regular Eggs Benedict. 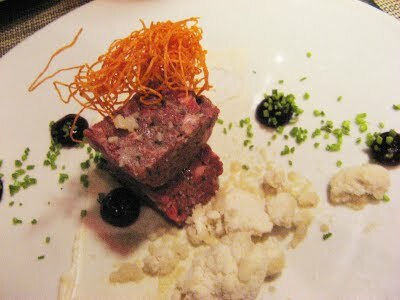 WD’s methods changed the texture and flavors of things that I thought I knew and gave me a new appreciation for tastes, flavors and of course food. Made me wish high school science classes were this much fun, maybe then I would of payed more attention. Phew, I must admit this was one of the hardest post to write, even when the waiters came with our dishes, the descriptions went on and on for a while. So interesting! Thank you for taking the time to describe it all so well. How awesome that you got to the meet the chef AND your "dessert crush". Frankly, even without his culinary super powers, he's pretty darn cute. I can't picture mustard and coconut together in the sauce for the pork, but I love the idea of a brioche chip and coconut jelly sounds intriguing. You have a Chubby business card??? Send me one! This looks like such an amazing experience! 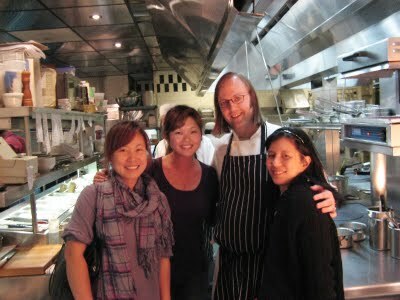 I'm impressed that you were able to take photos with Chef Wylie Dufresne and Pastry Chef Alex Stupak. I'm putting this at the top of the list of places to visit! I love this place and love that this style of cooking has gotten so popular. My boyfriend took me there about a year ago, and despite getting great pictures, I STILL haven't posted about it. Maybe this is the push I needed. Wow this looks amazing! So much fun. Wow. Reading those descriptions wore me out. I have never before seen eggs benedict that way! What a culinary roller coaster ride. Love the frozen oreo bite at the end too. OK, I have been itching to go for a while, but now you have forced me. Love your descriptions!! !